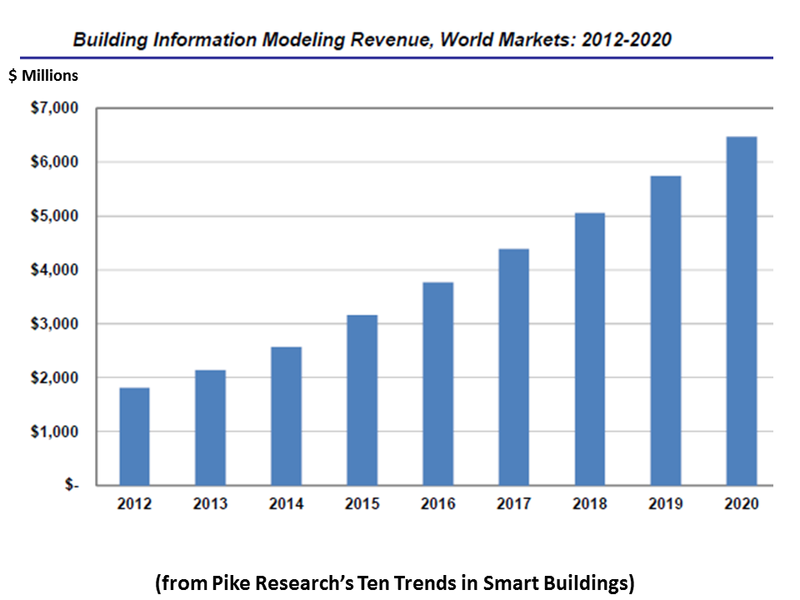 The smart building industry has been busy over the last few years. Advances in technology that make it easier to manage energy have considerably broadened the energy conversation, engaging not just facility managers, but also CEOs and CFOs. 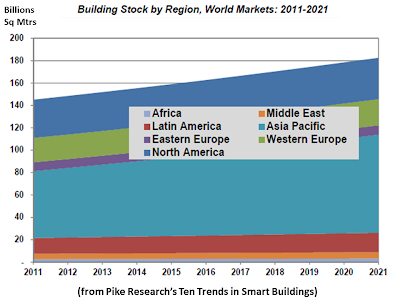 Although the effects of the global economic recession are still felt throughout the building and construction industries, technology vendors and integrators have continued to uncover new opportunities to improve energy efficiency in the existing building stock. The potential for energy efficiency has hardly been tapped even today. 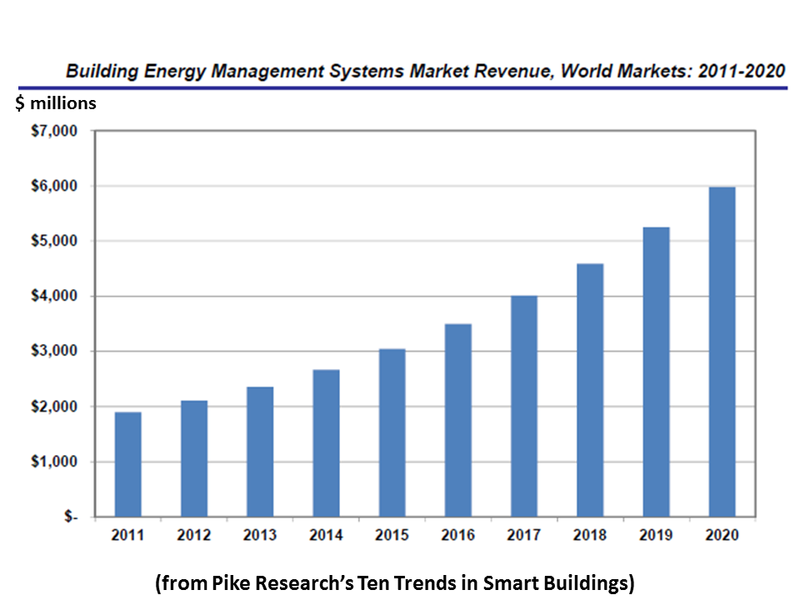 Smart buildings employ a wide range of technologies that improve efficiency and connect buildings to each other as well as to the grid using intelligent, information and communication technology (ICT)-based devices and networks. Many of the technologies required for qualifying as a smart building, such as energy efficient heating, ventilation, and air conditioning (HVAC) systems and submeters, are mature. 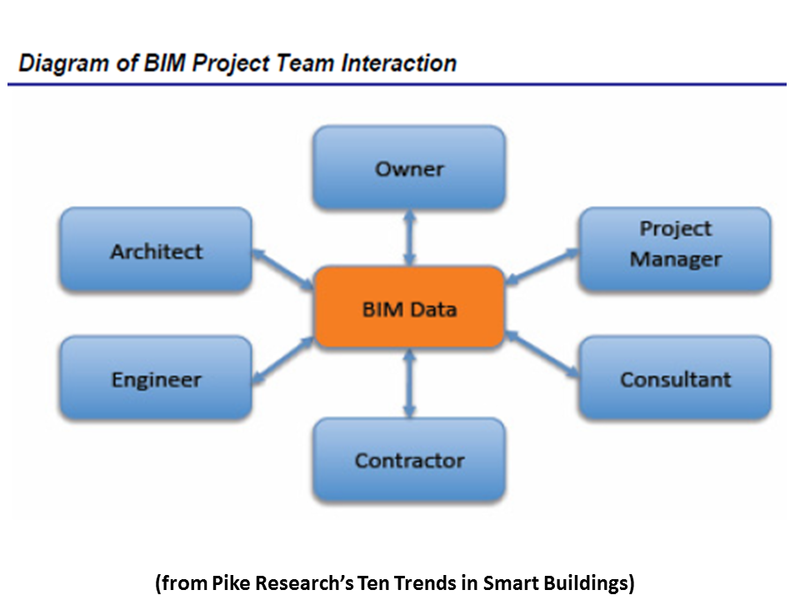 Others, such as building energy management systems (BEMSs) and building information modeling (BIM), are evolving rapidly and offer some of the most impactful innovations that the building industry has witnessed in years. 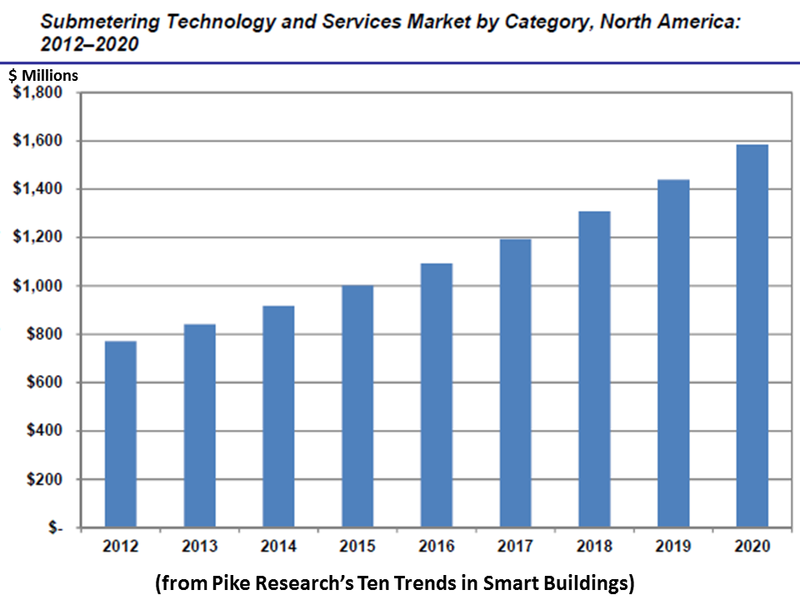 The challenge that integrators face today, however, is tying these systems together in a way that maximizes profitability and leverages the strengths that each service provider in the smart building ecosystem brings to the table. 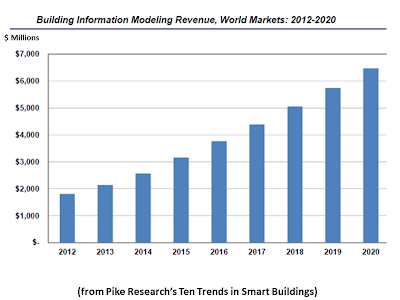 The one certainty is that demand for smart building technologies will continue to grow. The value proposition for many of these technologies has been demonstrated and a growing number of building owners are starting to adopt them with positive results. As the technology continues to evolve, improve, and decrease in cost, efficient and intelligent technologies will start to become an even more pervasive fixture in buildings worldwide. 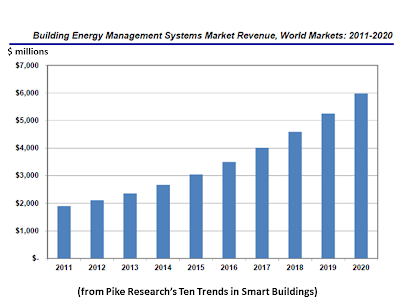 The last year has catapulted building energy management into the 21st century. Since the dawn of building automation, buildings have been producing volumes of information, but few in the building industry started tuning in until the last few years. Today, a number of players are tapping into the big data that buildings are constantly producing and uploading it into the cloud as the basis for rich software-as-a-service (SaaS) offerings. The building industry is highly fragmented. On the HVAC and equipment side, a handful of leaders, such as Schneider Electric and Johnson Controls, have large, multinational presences, but most of the market is divvied up among thousands of smaller companies, with a relatively narrow regional or technological focus. On the commercial real estate side, even CB Richard Ellis, the real estate firm with the largest footprint of space under management – 2.9 billion square feet (SF) – has captured less than 1% of the world’s 400 billion SF of commercial space. Energy service companies (ESCOs), the core of energy efficiency activity in many building markets around the world, tend to stick with known client categories and rarely change direction. In Western Europe, ESCOs focus their business on the public and commercial building sectors. In China, they tend to focus on the commercial and industrial sectors. In the United States, nearly three-quarters of ESCO business focuses on the municipalities, universities, schools, and hospitals (MUSH) markets. The MUSH market has provided a consistent source of revenue over the last few decades and the level of familiarity with ESCOs and energy performance contracting is high among these clients. 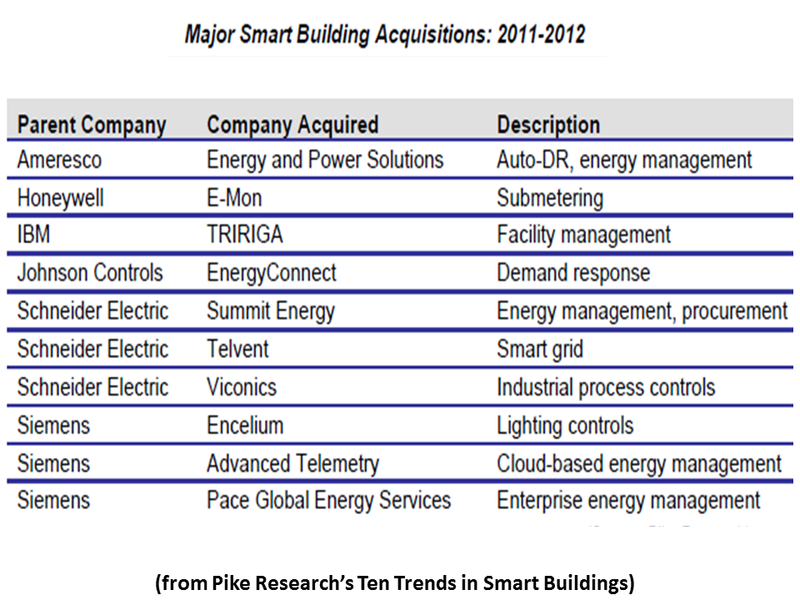 The word of the year in smart buildings is convergence. 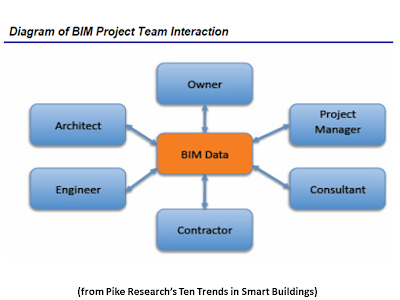 This concept broadly applies to the convergence of ICT with BMSs and other systems within buildings to create BEMSs that feed BMS-related data into centralized servers and software applications. Without a common IT network for building systems, coordinating all of a building’s systems in a way that optimizes energy efficiency and performance is difficult, if not impossible. 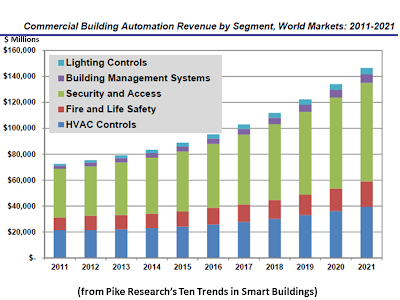 ICT-enabled building devices – including the traditional networked devices, such as thermostats, sensors, and controls, as well as, increasingly, HVAC equipment and lighting fixtures themselves – are becoming ubiquitous, leading to a complete landscape of smart devices that can be integrated into a single system. The average peak load is increasing every year. Last July, peak load in several grid operators’ domains broke their historic records. Extremely hot summers and cold winter days are partly to blame, but the growing population and the increasingly energy-intensive lifestyles of building occupants have also contributed to the increase. In response, many utilities and grid operators have turned to DR programs as a way to incentivize customers to reduce their non-essential energy demand. A smart building starts with a smart design. Many of the decisions that impact energy efficiency, such as the integration of HVAC, lighting, and other building systems, as well as basic considerations like orientation and materials, are made early in the design process and are difficult to change after the building’s initial design phases. 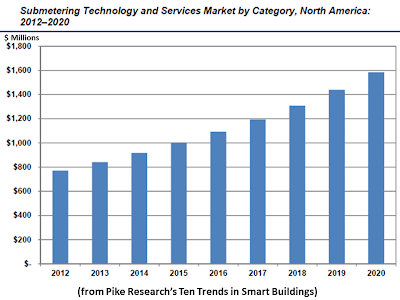 A broader view of the smart building industry reveals that much of the activity is happening less at the individual scale and more at the network level. BEMS tend to favor portfolios of buildings that can be controlled from a central location. In a sense, the intelligence that is finding its way into commercial and industrial buildings is creating a bird’s eye view of aggregations of buildings – and utilities are starting to pay attention. 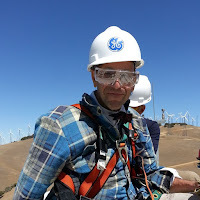 For example, Pacific Gas & Electric (PG&E) is working with the energy management firm, C3, to deploy energy management software across PG&E’s commercial and industrial customer base to benchmark facilities and identify poorly performing ones. 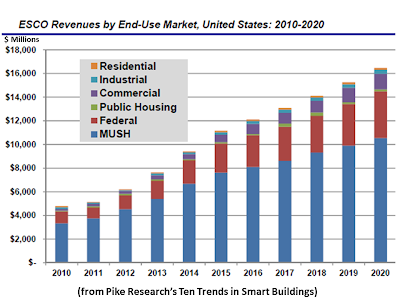 Utilities have long engaged customers on energy efficiency through demand-side management, but the pace and efficacy of such programs have received a considerable boost in recent years, as intelligent systems trickle into buildings. Around the world, moreover, grid operators are changing rules and providing market mechanisms that allow and incentivize DR, enabling demand-side resources (e.g., commercial buildings) to receive compensation for reducing their power demand during critical moments. Without sophisticated control systems, these types of programs would simply not be possible. The interest that smart buildings have piqued among utilities has led some energy management firms to turn their gaze to utilities as customers as well. Vancouver-based Pulse Energy has shifted its strategy to utilities, providing energy management software that specifically aims to assist utilities in achieving energy efficiency targets and improving customer satisfaction with service. Others, such as Retroficiency and FirstFuel, have considerably expanded their energy management offerings for utilities as well. These moves suggest that, while the needs and priorities of utilities are far different from those of building owners, deploying a single system across an entire utility customer base makes more marketing sense than netting individual building owners as customers one by one. 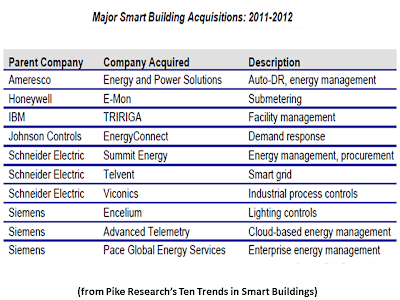 The high-profile acquisitions and product announcements that smart building leaders have made in recent years also indicate that the building industry is looking increasingly upstream and is enhancing its interactions with the grid. Schneider Electric’s acquisition of leading smart grid firm Telvent, and Johnson Controls’ acquisition of DR firm EnergyConnect illustrate that building industry leaders are eager to tie buildings with the grid through an intelligent network. In January 2012, Echelon announced a new suite of products designed to make buildings grid-aware by integrating disparate BASs and enabling them to respond to real-time grid conditions. These are just a few of the many examples of how the building industry is taking a much more expansive view of the types of services they aim to offer building owners and managers to address the smart building market opportunity. In the future, the definition of a smart building will continue to expand, as the technology evolves and as the regulatory and standards environment for DR and building automation matures. Together, smart buildings and the smart grid will continue to reinforce each other, providing continuing opportunities to improve energy efficiency, as well as the economics of operating the electricity grid. “Financing of U.S. solar projects is in the midst of a transformation, with new business models, new investors and new financing vehicles gaining sway, according to new research [in Re-Imagining U.S. 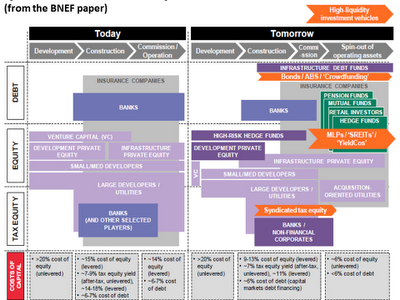 Solar Financing] by Bloomberg New Energy Finance (commissioned by Reznick Group). “The evolution toward a broader investor base is expected to help maintain growth for U.S. solar deployment. Asset financing for U.S. PV projects has grown by a compound annual growth rate of 58% since 2004 and surged to a record $21.1 billion in 2011, fueled by the one-year extension of the U.S. Department of the Treasury's Section 1603 cash-grant program…Funding the next nine years of growth (2012-2020) for U.S. PV deployment will require about $6.9 billion annually on average, the report says. 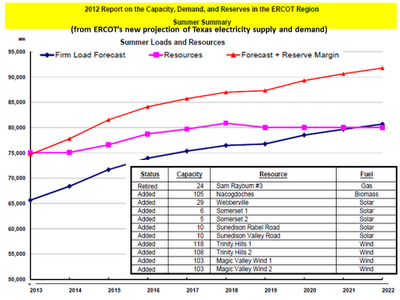 “The Electric Reliability Council of Texas (ERCOT) says it foresees potential electricity shortages within the coming decade as electricity use in Texas continues to hit new records…The newly revised Capacity, Demand and Reserves (CDR) report shows a reserve margin of 9.8% by 2014. That is well below ERCOT's 13.75% target for electric generation capacity that exceeds the forecast peak demand on the grid. The 2014 outlook includes slightly more than 75 GW of power to serve an anticipated peak demand of 68 GW. 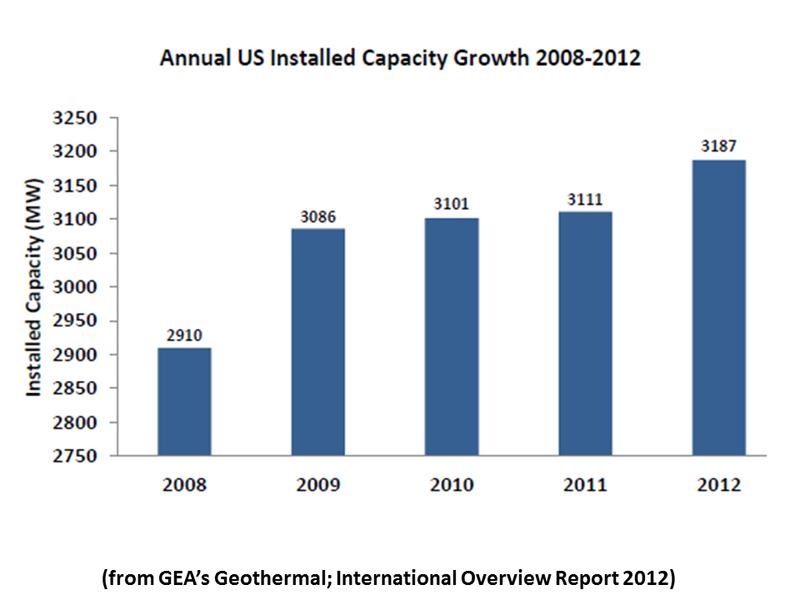 The global geothermal power market continued to grow substantially in 2011-12, outpacing the US geothermal market by a noticeable margin. 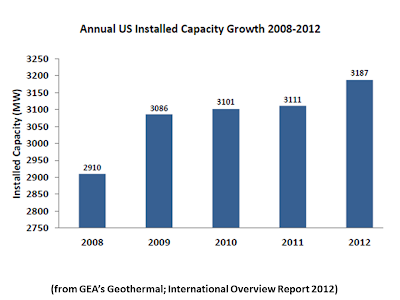 As of May 2012, approximately 11,224 MW of installed geothermal power capacity was online globally. 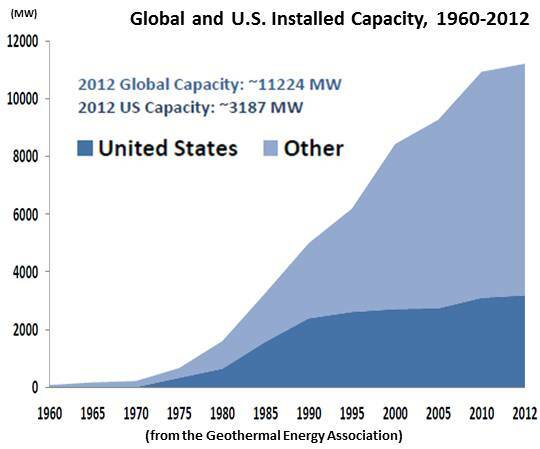 In 2010 geothermal energy generated twice the amount of electricity as solar energy did worldwide. 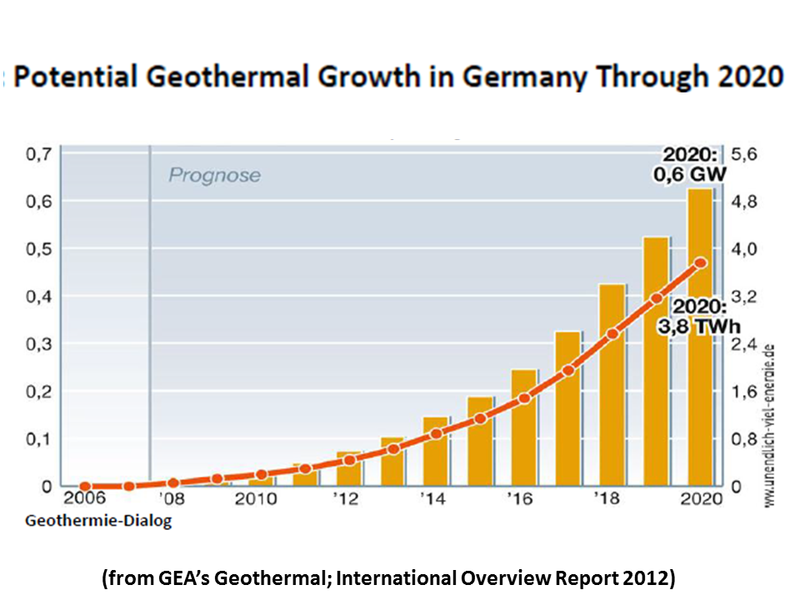 Geothermal growth is currently fueled by a number of factors: economic growth, especially in developing markets; the electrification of low-income and rural communities; increasing concerns regarding energy security and its impact on economic security. Additionally, the majority of the growth in the development of global geothermal resources is occurring in countries with large, untapped, conventional resources. 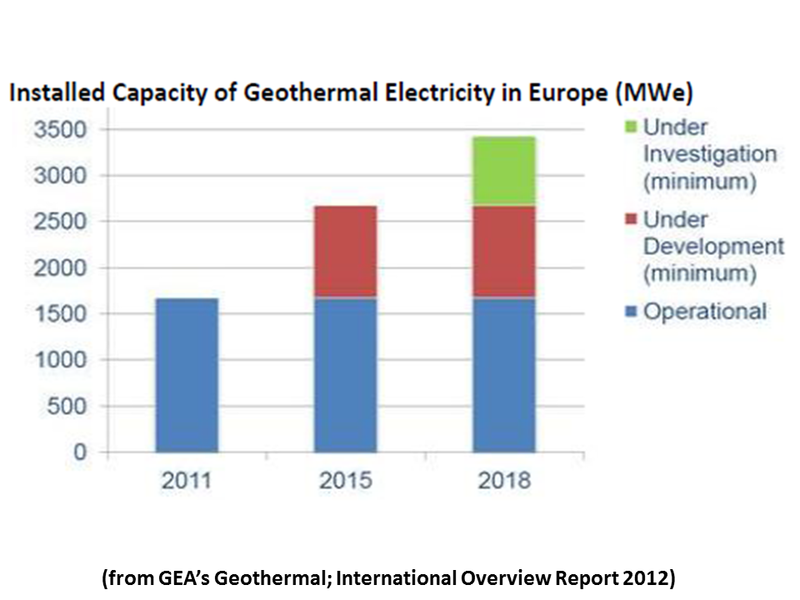 As more countries recognize and understand the economic value of their geothermal resources, their development and utilization becomes a higher priority. 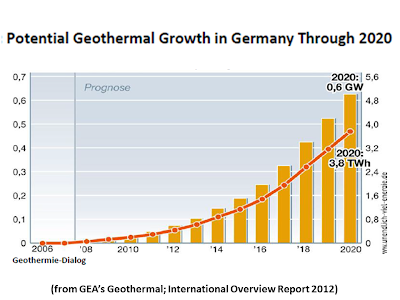 New technology appears to be underpinning geothermal expansion in some regions which have already seen significant development of their conventional resources. In the US and Europe, for example, the geothermal industry is increasingly using binary technology that can utilize more moderate and low temperature resources to generate electricity. Also, energy and economic security are compelling drivers for the adoption of policies supporting geothermal development in countries like Chile and Japan. In nearly every case, national policies are propelling growth in the strongest markets, while the current world leader – the US – appears to be growing more slowly due to policy uncertainties. 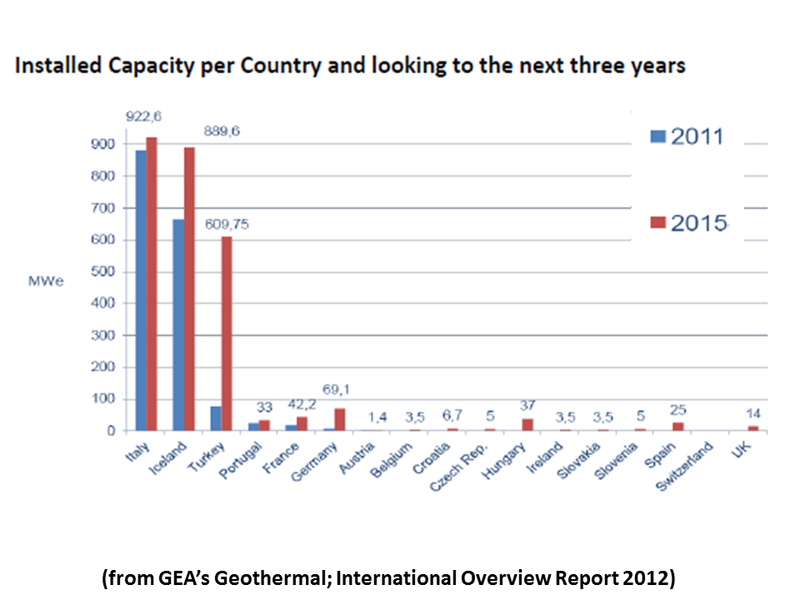 This report highlights geothermal resource development in certain countries, as well as the policy and economic drivers behind that development. The market trends observed will be the object of more thorough analysis in future studies. A number of factors are leading certain countries in Africa to explore the viability of developing the continents geothermal resources. First, Africa has the smallest amount of energy use of any populated continent in the world. Only approximately 25 percent of Africa’s population has access to electricity, more than half of which is traditional biomass which contributes to deforestation and health problems. Increasing demand for electricity also adds impetus to the need to increase access to electricity in Africa. At the same time, increasing demand for electricity exacerbates issues currently associated with Africa’s electricity sector. For example, reliance on imported petro-products for thermal power generation exposes African countries to the price volatility of fossil fuels. Additionally, due to climactic fluctuations, the reliability of hydropower as a primary source of electricity for many African countries has been called into question. In the past few decades South America has at times enjoyed economic growth due to the development and exportation of its oil and gas resources. However, economic and diplomatic issues surrounding the flow of energy across borders have had adverse impacts on the economies of South American countries. 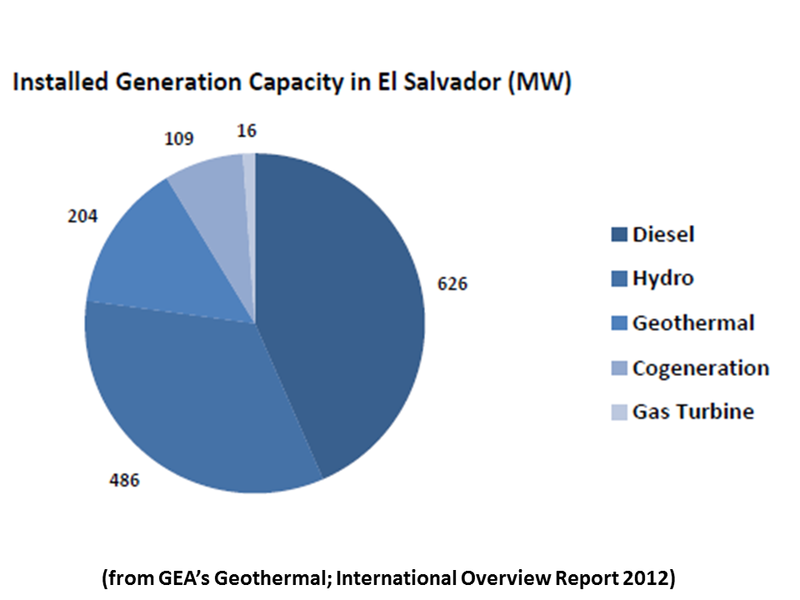 For example, Argentina abruptly cut off supply of natural gas to Chile in mid-2004; and a transmission line built a few years ago to connect Peru and Ecuador has rarely been used due to disagreement on electricity price. Reports of blackouts and worker strikes have become increasingly regular. At the same time, energy consumption and demand is growing in South America and is projected to increase by 72 percent through 2035(includes Central America), according to the EIA. Awareness of climate change issues is another factor leading many of these countries to seek development of renewable resources. The melting of Andean glaciers and changing rain patterns have negatively impacted local agriculture and residential patterns thanks to the dwindling water supply. The United Nations predicts that Latin American countries will be severely affected by climate change, despite the fact that the region’s greenhouse gas emissions represent a small proportion of total global emissions. 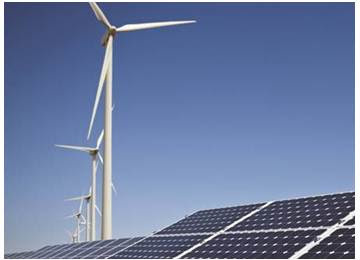 To address the of issues energy security, increasing demand, and sustainability, some countries in South America have taken steps to increase domestic energy security by supporting the development of their renewable energy resources. Geothermal resources represent an opportunity to meet energy needs with a clean, baseload, sustainable form of energy in South America, particularly along the Andean Mountain Range and the Southern Cone of the continent. Experienced companies from Australia, Italy, the US, and other countries are taking an interest in the development of South America’s geothermal resources. Many are partnering with a resident company, bringing local understanding to the project as well as making development more feasible. Some local and international mining companies have undertaken smaller scale operations, working to develop geothermal resources to help meet the electricity needs of their operations. The principal countries of North America – Canada, Mexico and the US – have some of the highest standards of living in the world, as well as high electricity demand and degrees of electrification. However, the continent is also relatively well supplied with fossil and other conventional energy resources. Moreover, neither Canada nor the United States has adopted national climate policies and neither is currently a signatory to the Kyoto protocol. 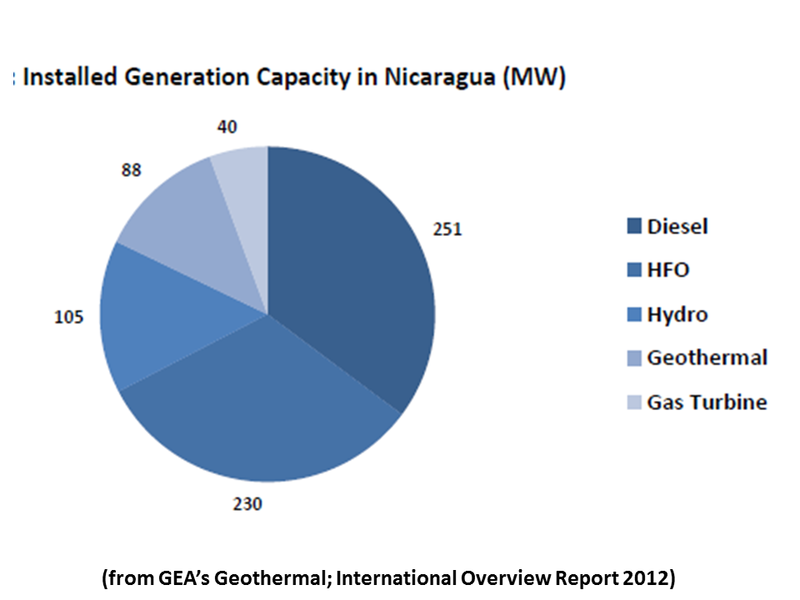 While North American countries may not be as exposed to the same factors incentivizing emerging economies to develop their renewable resources, there is still a strong case for the increased implementation of geothermal energy into their economies as well. In the US, coal and natural gas respectively generated approximately 42 and 25 percent of total electricity generated in 2011, indicating that North American economies are also vulnerable to the adverse impacts of the price volatility of fossil fuels. Additionally, electricity demand is projected to grow by 0.8 percent per year in the US through 2035, indicating that additional generating capacity will be needed, although not at the scale of most emerging markets.76 In order to increase their energy security by meeting rising demand and mitigating the use of fossil fuels, North American countries are taking steps to increase their production of renewable energy resources, including geothermal. 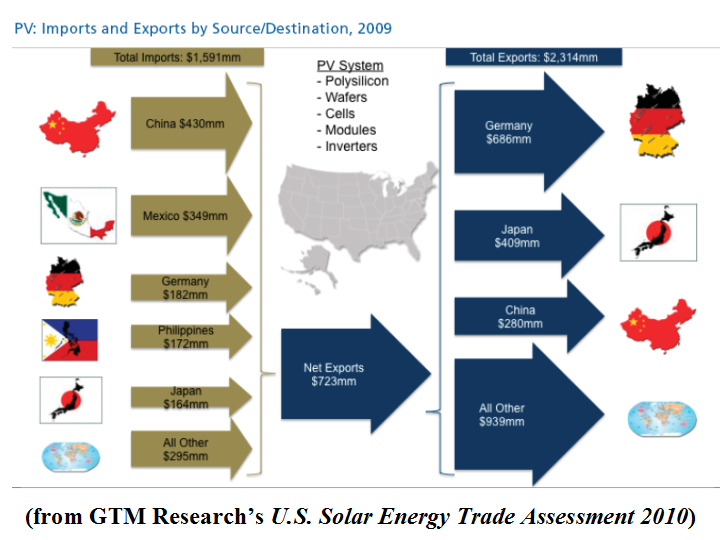 “Incentive programs for solar and other forms of renewable energy in five U.S. states violate international free-trade rules and treaties, according to China's Ministry of Commerce. Bloomberg reports that the ministry has ruled…[they] break World Trade Organization rules…In addition, 14 China-based PV manufacturers have formed a new coalition in response to the U.S. Department of Commerce's (DOC) announcement last week that tariffs would be applied to solar modules exported from China to the U.S.
“Installing a substantial amount of wind power, along with upgrading transmission in the Midwest Independent Transmission System Operator (MISO) territory, could have positive consumer benefits at a lower cost than is assumed, according to a report sponsored by the Americans For A Clean Energy Grid (ACEG)…[The study of wind-related transmission investments for MISO projects] concludes that consumer electricity prices would decline under low- or high-transmission scenarios. 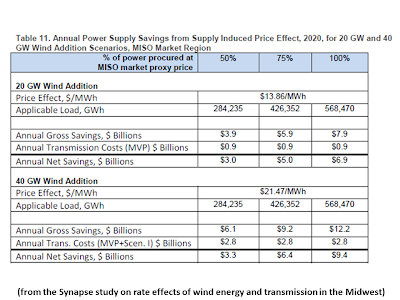 Transmission projects would still be required to connect remote wind resources…and "backbone" investments would still be needed…[but] continuous investment cycles of extra-high-voltage lines should not be necessary, and the cumulative rate impacts should remain small…Transformation of the supply fleet to much more flexible operation…[and] extensive coordination, control and forecasting improvements in the electric power sector, could also mitigate the need for…[much more] transmission…"
Green marketing—a marketing strategy highlighting the environmental attributes of a product—dates back to the 1970s but began to flourish in the early 1990s. 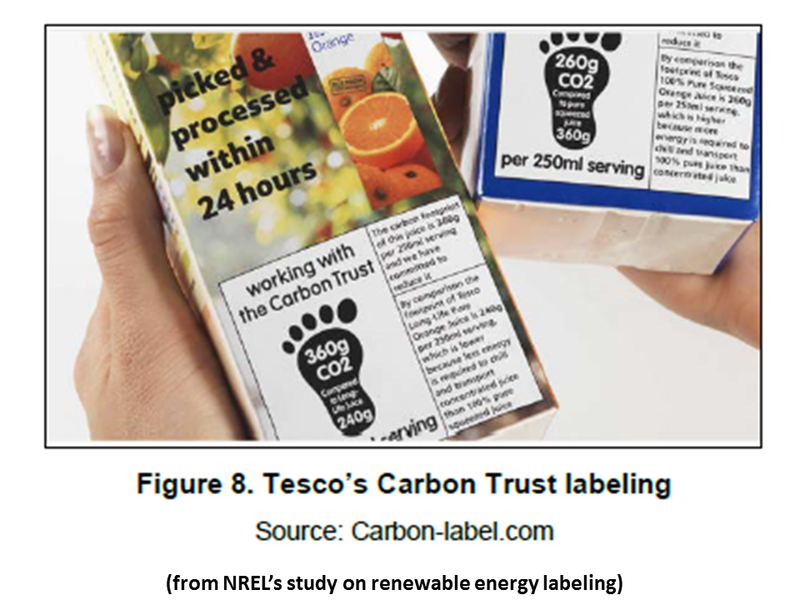 More recently, a number of companies using renewable energy in the manufacture of products have begun to communicate renewable energy use directly on product packaging, relying either on a logo or some combination of text and imagery. This report discusses the experience of companies that communicate to consumers that products are “made with renewable energy.” Corporate commitments to using renewable energy, and communicating that commitment on product packaging and through other means, could play an important role in educating consumers about the availability and feasibility of using renewable energy as an alternative energy source. 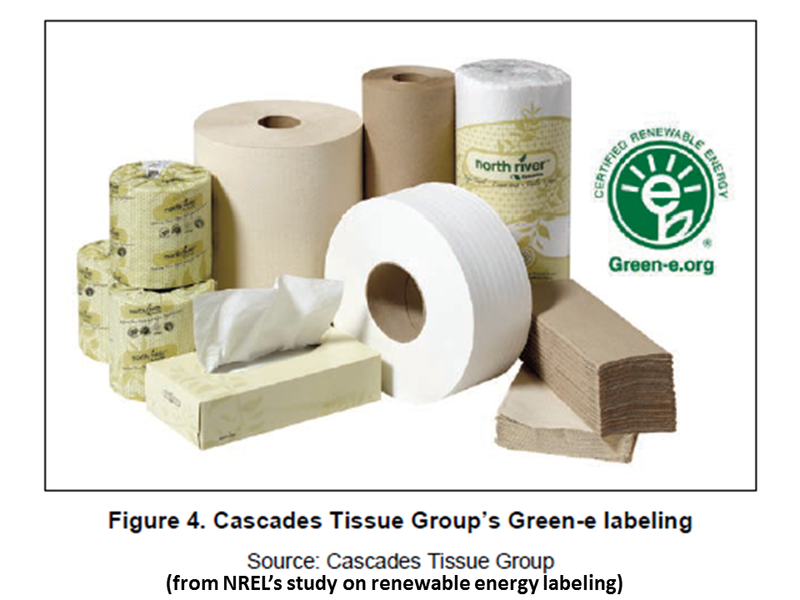 Researchers identified nearly 50 companies that communicate renewable energy use on product packaging. Representatives from 20 companies were interviewed and asked to discuss their experiences marketing products produced with renewable energy. Companies take a variety of approaches to communicating to consumers that their products are made with renewable energy. Some companies are labeling on-product, while others are using their websites, social media, and other promotions. 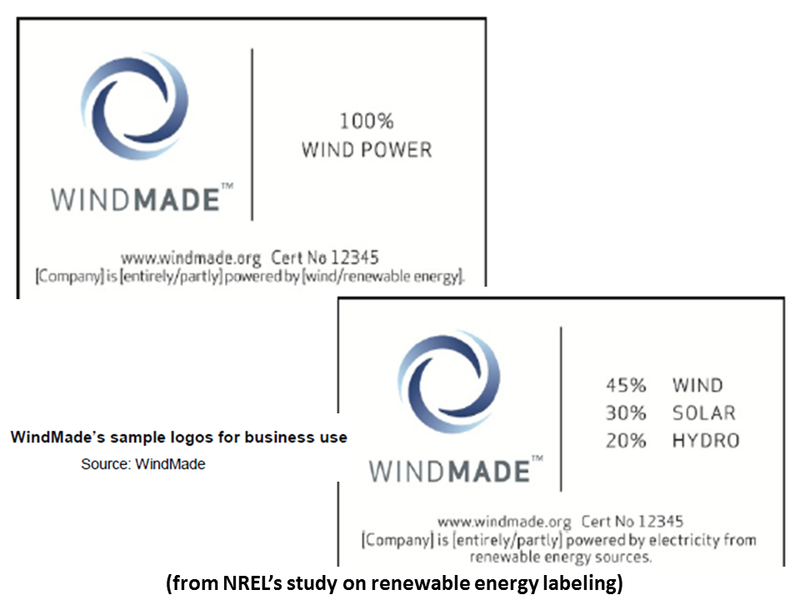 On-product labeling can include use of a logo or use of imagery and statements, such as a picture of a wind turbine and note that the product is made with renewable energy. Why are companies promoting the use of renewable energy on products? The primary motivation identified was to communicate to the consumer about the company’s commitment to renewable energy and, in doing so, enhance the image of the brand. Other motivations included differentiating a product, targeting environmentally conscious consumers, and to a lesser degree, following an existing industry trend and earning a price premium. 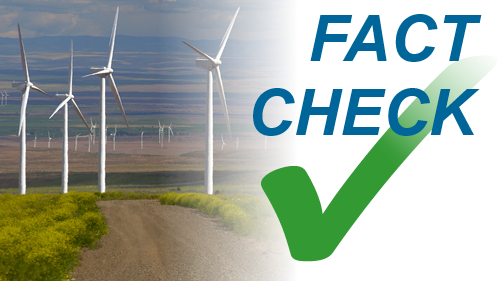 What challenges do companies face when making on-product claims about renewable energy? One of the primary challenges identified was the limited and competing uses of physical space on a product (“product real estate”). Other challenges included determining the appropriate language and content to include and knowing whether consumers will recognize and understand renewable energy messages. Costs associated with modifying packaging, costs of certification and program requirements for use of a third-party logo, and international product marketing were identified as minor challenges. 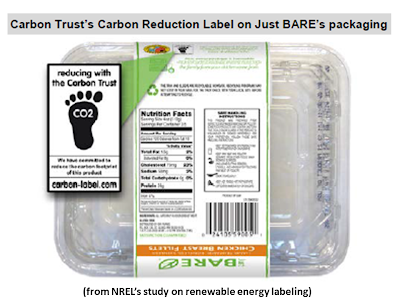 The future growth rate of this new market for labeling products with renewable energy claims remains to be seen. While some lessons can be learned from how eco-products have been marketed historically, products that are made with renewable energy are unique in that they are identical to the comparable conventional product in quality and performance; only the energy used to manufacture the product is different. Green marketing—a marketing strategy highlighting the environmental attributes of a product, often through the use of labels or logos—dates back to the 1970s. 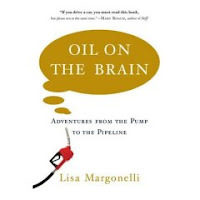 It did not proliferate until the 1990s (Rex and Baumann 2007), however, when extensive market research identified a rapidly growing group of consumers with a heightened concern for the environment. Consumers expressed not only a preference for green products but also a willingness to pay a premium for such products (Peattie and Crane 2005). The response was a surge in green marketing that lasted through the early 1990s. 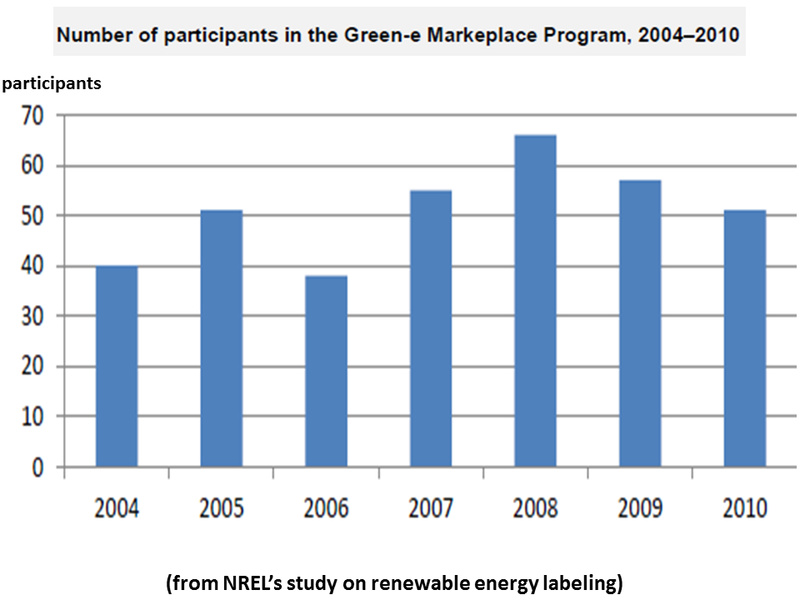 By the mid-1990s, however, the green marketing rush had waned. The market for green products had remained relatively weak due to the apparent gap between environmental concern and sales suggested by consumer surveys to actual sales achieved (Rex and Baumann 2007; Peattie and Crane 2005). Although green products remain a niche market, more than 80% of consumers continue to express interest in protecting the environment, even though those levels have declined slightly in recent years (Natural Marketing Institute 2011). As such, companies continue to pursue new ways of communicating their actions to protect the environment to consumers. Providing information on the type of energy used to produce a product—specifically whether it is made with renewable energy—is an emerging strategy. Survey data suggest that consumers view renewable energy favorably and prefer products made with renewable energy sources. Surveys conducted by the Natural Marketing Institute, for example, found that 80% of consumers in 2010 indicated that they care about the use of renewable energy (Natural Marketing Institute 2011). Additionally, a recent poll conducted by Vestas and TNS Gallup found that 65% of consumers worldwide prefer products that are made with wind energy (Vestas and TNS Gallup 2011). 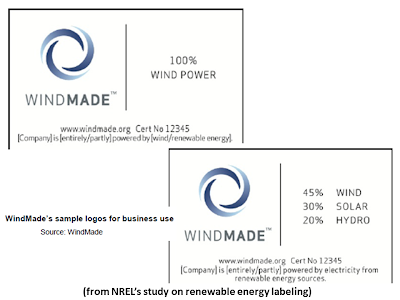 A number of companies using renewable energy in the manufacture of products communicate this directly on product packaging, relying either on a logo or on some combination of text and imagery (e.g., wind turbines). Other companies have refrained from using on-product messaging and rely on other types of marketing collateral to communicate their use of renewable energy, typically via their websites. In general, communicating the renewable energy content of products differs from some earlier green marketing efforts that often focused on modifications made to the products themselves. One reason the adoption of green products has been limited is because green products often do not compete with comparable conventional products on important dimensions, such as price, quality, or performance (Gallastegui 2002). Products that use less material or recycled material, for example, could be viewed as inferior or less effective. In contrast, the use of renewable energy in the manufacture of a product has no impact on the quality of the product itself. Therefore, previous experience with green marketing might not be entirely transferable to this new strategy of communicating the renewable energy used in manufacturing a product. This report discusses the experience of companies that communicate to consumers that products are “made with renewable energy.” Representatives from 20 companies were interviewed and asked to discuss their experiences marketing products produced using renewable energy. Interview participants were asked to discuss motivations for making on-product claims and to describe their primary challenges in labeling products with renewable energy use. The small number of interviews would not have provided robust quantitative data; therefore, interviews focused on gathering qualitative responses. 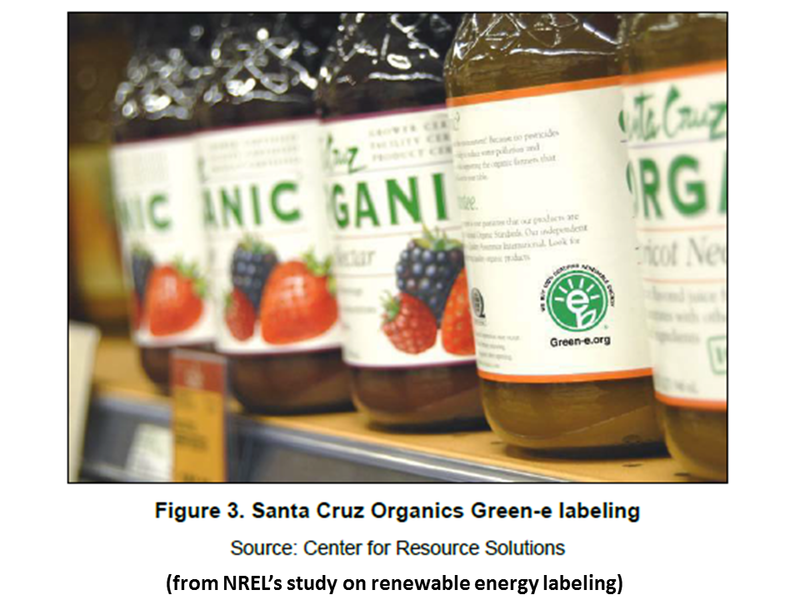 The first half of this report provides an overview of the type of companies that have labeled products or advertised them as being made with renewable energy. It also highlights the avenues companies use to describe their use of renewable energy. What follows is a discussion of the motivations for making on-product claims about the use of renewable energy and the challenges in doing so, based on insights learned through the interview process. Marketers have highlighted a variety of environmental attributes of products for several decades, but specifying the type of energy used to manufacture a product is a trend that has only emerged in the past decade. 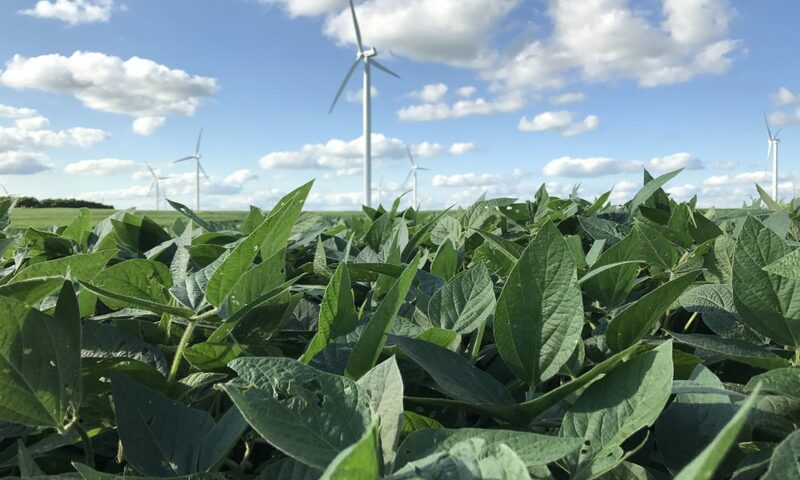 In the United States, the number of companies marketing products as “made with renewable energy” has increased substantially in the past several years, although the market remains small. In 2011, researchers identified about 50 companies that use renewable energy labeling on products. 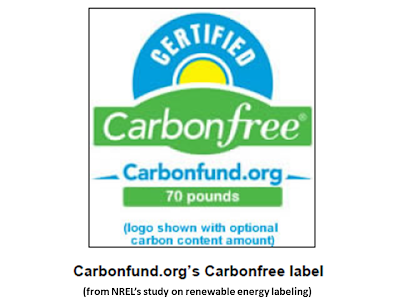 Through interviews with 20 companies with experience labeling products as “made with renewable energy,” we have found the following: (1) the companies range in size, (2) some companies are in the business-to-business sector and many others are in the business-to-consumer sector, (3) companies span a wide array of industries, and (4) companies vary in terms of the scope of their labeling efforts, with some labeling a specific product and others labeling a product line or all company product lines. Motivations for labeling products differ. Some companies are motivated by the ability to differentiate a product through using a “made with renewable energy” message, appealing to the environmentally conscious consumer. Other companies reported that the primary motivations were to confirm an already existing commitment to sustainability or to enhance the image of a brand. None of the companies interviewed attempted to earn a price premium on the product because of the use of renewable energy in its manufacture. 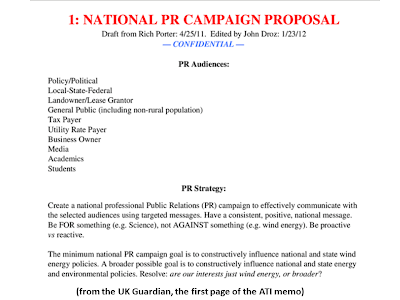 Methods of communicating the use of renewable energy vary. Some organizations have relied on logos or imagery to convey the use of renewable energy in the manufacture of a product and others have included text on the product packing. 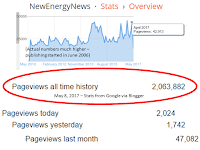 Others have complemented this by providing information on websites about their renewable energy purchases and the associated benefits, and some have used social media and other promotions to convey their use of renewable energy. There are numerous challenges associated with communicating the use of renewable energy directly on products, including the limited real estate available on product packaging and determining the appropriate content to include. 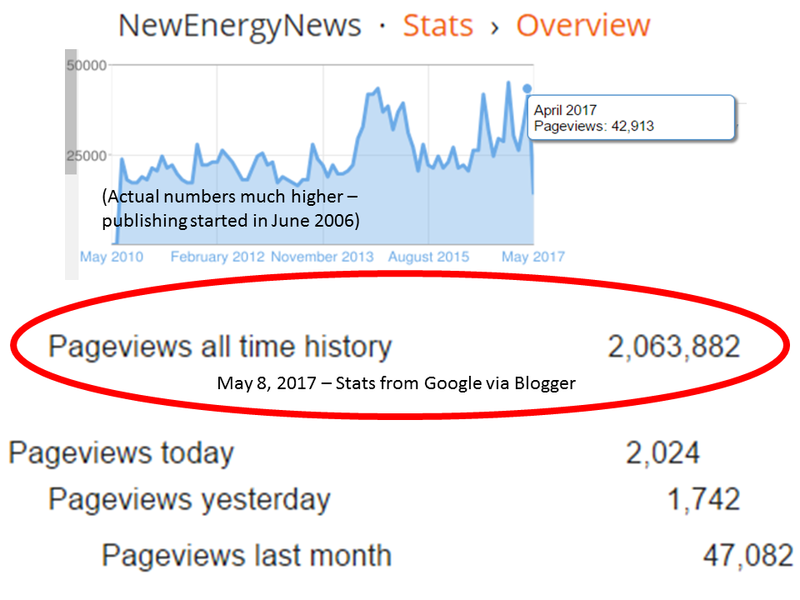 Another challenge is the difficulty in assessing how effective “made with renewable energy” claims are in increasing product sales. Further, there often is uncertainty as to whether the customer recognizes the logo used and understands the information being conveyed. Lessons from earlier green-marketing experience indicate that a label or logo that is recognizable, easy to understand, and trusted is more effective at conveying information to the consumer—as a result, they contribute to market growth (Rex and Baumann 2007). 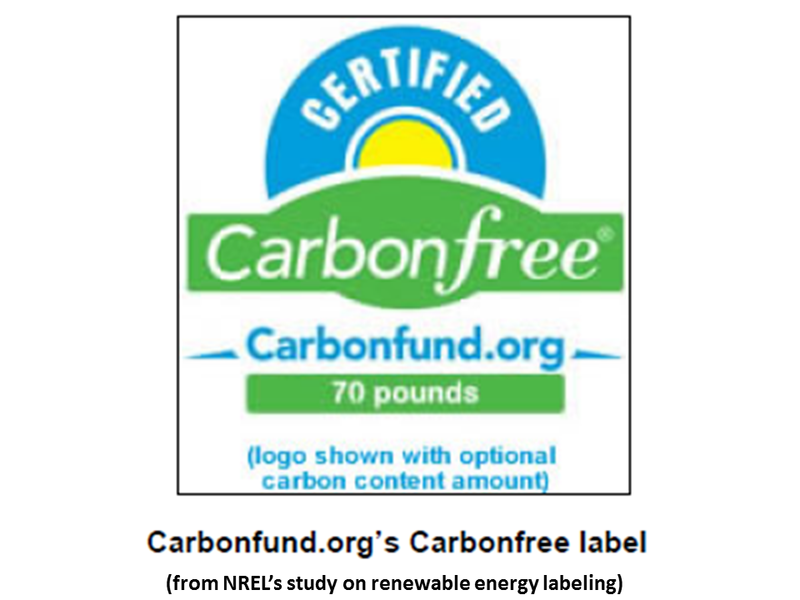 The limited experience with renewable energy logos, however, makes it difficult to adequately gauge recognition and understanding. A multi-attribute label is something that could address multiple environmental attributes, not just use of renewable energy. Interviewed companies highlighted that a multi-attribute label could address concerns about limited packaging real estate and simplify the certification process on the company end. Some lessons can be learned from how eco-products have been marketed; however, products that are made with renewable energy are unique in that they are identical to the comparable conventional product in quality and performance; only the energy used to manufacture the product is different. Given this new market, it remains to be seen the extent to which products “made with renewable energy” will be utilized and support the use of renewable energy. Corporate commitments to using renewable energy and communicating that commitment on product packaging and through other means could play an important role in educating customers about the availability and feasibility of using renewable energy as an alternative energy source. “Global carbon-dioxide (CO2) emissions from fossil-fuel combustion reached a record high of 31.6 gigatonnes (Gt) in 2011, according to preliminary estimates from the International Energy Agency (IEA). This represents an increase of 1.0 Gt on 2010, or 3.2%. Coal accounted for 45% of total energy-related CO2 emissions in 2011, followed by oil (35%) and natural gas (20%). 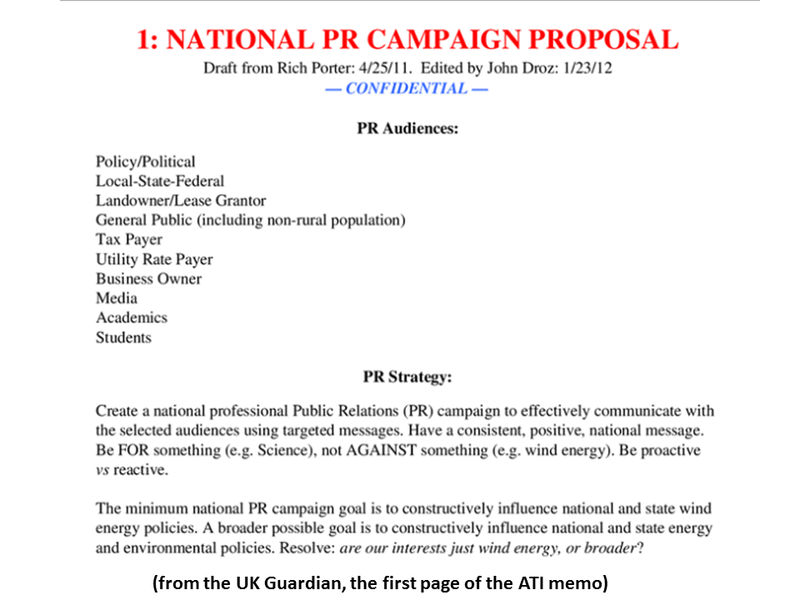 “A network of ultra-conservative groups is ramping up an offensive on multiple fronts to turn the American public against wind farms and Barack Obama's energy agenda…A number of rightwing organisations, including Americans for Prosperity, which is funded by the billionaire Koch brothers, are attacking Obama for his support for solar and wind power. 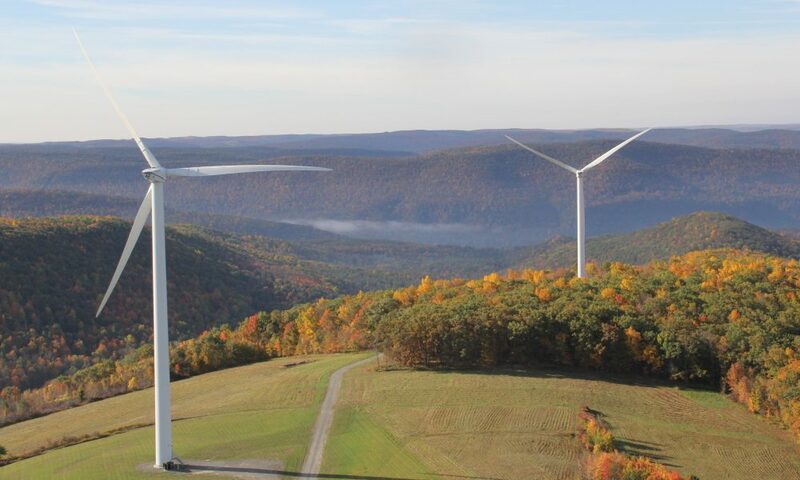 The American Legislative Exchange Council (Alec), which also has financial links to the Kochs, has drafted bills to overturn state laws promoting wind energy. 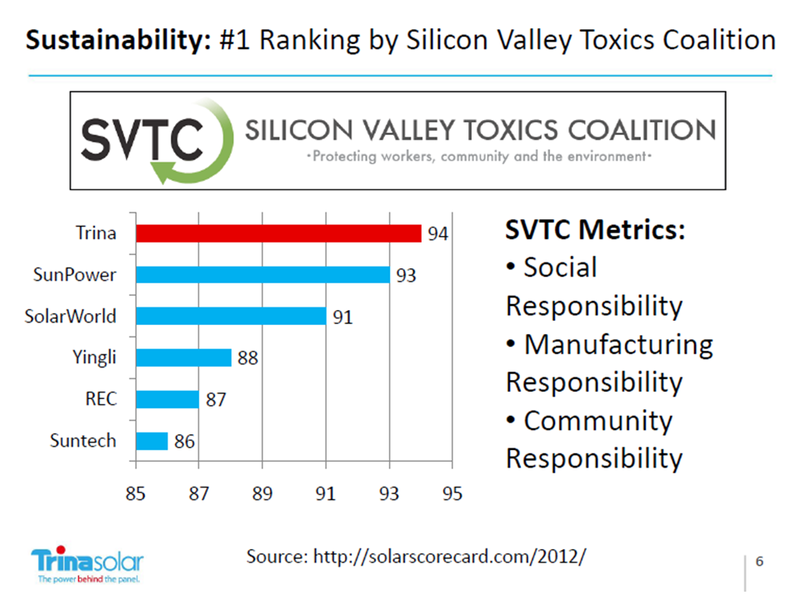 “…The trade-war discussion has also encompassed…the belief that Chinese factories - including solar fabs - create hazardous working conditions, flout pollution laws and generally act as poor corporate citizens…[but China-headquartered Trina Solar was recently crowned the cleanest PV manufacturer by the Silicon Valley Toxics Coalition (SVTC) in its third annual Solar Scorecard. 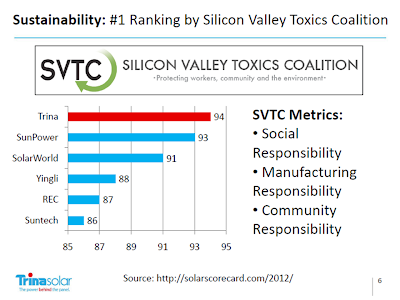 Trina unseated last year's winner, SolarWorld, as the most environmentally friendly and worker-friendly PV manufacturer. Holiday Weekend Reading: NRG Settlement Funds California’s ‘Electric Expressway’ EV Charger Network; $120 million will buy thousands of chargers ordered by Governor Brown that startup Gridtest’s tool can certify. NRG Settlement Funds California’s ‘Electric Expressway’ EV Charger Network; $120 million will buy thousands of chargers ordered by Governor Brown that startup Gridtest’s tool can certify. A $120 million settlement between the California Public Utilities Commission (CPUC) and NRG Energy Inc. will fund the building of a network of charging stations for battery electric vehicles (BEVs) the length and width of the state, as ordered by California Governor Jerry Brown. Startup Gridtest Systems' vehicle charging equipment test and measurement tools, said to be the first for the charging industry, can validate the network’s performance capabilities. The CPUC-NRG money, a settlement stemming from the 2001 California energy crisis, will pay for a statewide infrastructure of at least 200 public fast-charging stations and another 10,000 plug-in units at 1,000 locations. The Gridtest Systems tools will enable both the design and in-field testing of the compatibility between the growing array of charging stations and the expanding selection of BEVs. The first $100 million of the payment from NRG Energy to the state settles claims against NRG’s predecessor Dynegy for March 2001 long-term power contracts it failed to fulfill. It will pay for fast-charging stations, plug-in units and electrical upgrades, at no cost to California's drivers or taxpayers. The infrastructure is expected to drive the state’s transition to BEVs. The other $20 million from NRG Energy will go to electric utility ratepayer relief. 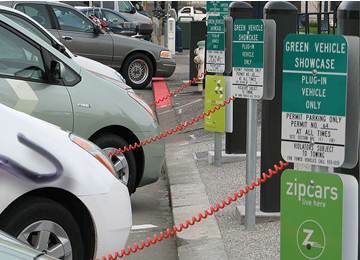 As the settlement was announced, Governor Brown’s office issued an executive order to drive the deployment of 1.5 million zero-emission vehicles (ZEVs) in California by 2025. 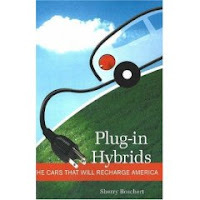 • California’s personal transportation is to be essentially all-ZEV by 2050 so that greenhouse gas emissions from the state’s transportation sector are 80 percent below 1990 levels. This effort in California joins efforts by imported oil-dependent states and nations from Hawaii to Ireland and Denmark to Taiwan to move electric transportation to mainstream markets. 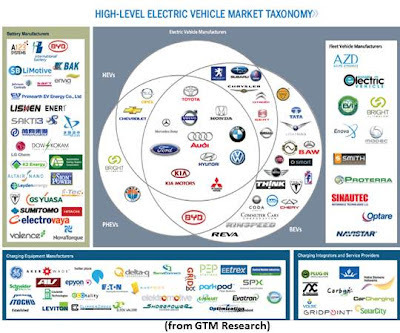 The demand for BEV charging systems is forecast by Pike Research to reach $4.3 billion per year by 2017. Yet “charging today is like dial-up internet,” Gridtest Systems founder and CEO Neal Roche said. “The charging station is at the edge of the smart grid [... and] people are building more intelligence into it.” Eventually, he said, chargers will know the intricacies of electricity pricing, home network energy management and vehicle-to-grid power. They will handle billing and authentication for public sites. And they will charge faster. Roche was working at BEV and battery charging technology pioneer AeroVironment when he saw the interface challenge coming to vehicle charging. “Everyone’s building charging stations,” Roche said, mentioning multinationals like ABB, Bosch, GE, Siemens, Schneider Electric, as well as small startups like Coulomb Technologies, ECOtality and Clipper Green. GM has publicly specified “a list of compatibility problems that can prevent electric vehicles from charging” and called for “detailed testing of the compliance of charging stations” to the standard established by the Society of Automotive Engineers. Roche specializes in the “protocol in the middle” when “two networks are talking to each other,” he explained. 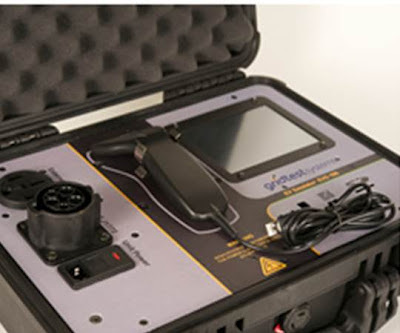 The Gridtest Systems tool, for which he projects a $300 million to $500 million market worldwide by 2017, will allow laboratory researchers who are building chargers and field technicians who are installing and repairing chargers to know whether the chargers are in compliance with established standards and therefore are safe for the BEVs to plug into. Holiday Weekend Reading: The Lowdown on the Safety of First Solar’s CdTe Thin Film; Locals are worried about cadmium, but a First Solar scientist says CdTe is not the same. 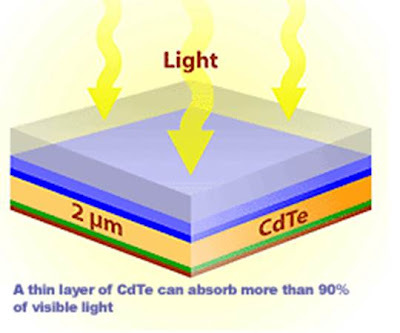 The Lowdown on the Safety of First Solar’s CdTe Thin Film; Locals are worried about cadmium, but a First Solar scientist says CdTe is not the same. Those who live near the 230-megawatt Antelope Valley Solar Ranch One want to know whether the 3.7-million cadmium telluride (CdTe) thin film solar panels First Solar will install in their desert terrain are a threat to them. First Solar Director of Environmental and Sustainable Development Dr. Parikhit Sinha explained to a gathering of local leaders that cadmium telluride, “one of the best known semiconductors,” is not the same thing as cadmium. CdTe is still a potentially toxic material. But the way it is encapsulated in glass in First Solar panels, Sinha said, sharply limits the possibility of inhalation or ingestion exposure. Freeing the CdTe from the laminate is the biggest challenge of recycling, Sinha said. It would take a very rare and daunting set of circumstances to both free the CdTe and release cadmium. But Antelope Valley residents, who know their desert to be a rare and daunting place, were not convinced even when Sinha talked about the accelerated life cycle testing the panels are subjected to and the international certifications they have earned. Speaking for those who will have to live with the panels, a local noted that First Solar has been in business less than half the 25-year term of the panels’ warranty. The accelerated life cycle testing, another pointed out, covered only ten years. And First Solar’s real-world experience with the panels, he added, is even less than that. 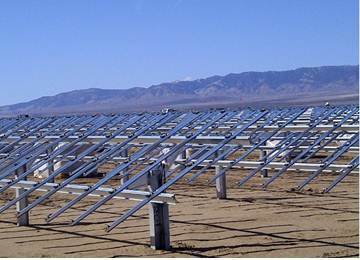 Breakage at First Solar power plants, Sinha said, is expected to be one percent over 25 years. In keeping with SVTC-set aims, First Solar has, Sinha indicated, a pre-funded end-of-life take-back and recycling program. At those temperatures, Sinha said, the CdTe would remain stable. In tests at up to 1,100 degrees Celsius, he added, the CdTe migrated into the heat-softened glass and was encapsulated. Only 0.4 percent of it would be released. “But 0.4 percent times 3.7 million could be a lot,” a local councilman pointed out, suggesting such a volume of cadmium fumes could make the air toxic or leach into the ground water. “Like the MBTE problem,” another councilman added. “But the likelihood of the entire site, or even a significantly large portion of it, being burned without response is low,” Sinha pointed out. For firefighters answering such a call, the biggest danger is the electricity, he said, which they are trained to deal with. AVSR1’s neighbors next raised questions about unexpected events, like a lightning strike or the crash of a flight from nearby Edwards Air Force Base. Such extreme, highly unlikely occurrences, Dr. Sinha said, are “highly visible” and would, therefore, get an immediate response. This was little comfort to those who remained dubious. “I majored in common sense,” one email correspondent noted, admitting to no scientific education. “Well, we’re going to learn,” one of the most skeptical concluded. First Solar’s efforts to demonstrate the safety of its technology followed ongoing efforts to demonstrate the opportunity in solar power plant development. The company has gifted $350,000 in community benefits and, with the project still less than half complete, has spent over a quarter of a million dollars with local vendors. In addition, AVSR1 is already providing 200 full-time construction jobs, a number that will soon go to 350, in a region where unemployment has been 15 percent. Holiday Weekend Reading: Study -- Grid Parity for Solar in North Carolina; This could mean a huge new opportunity for PV. Study -- Grid Parity for Solar in North Carolina; This could mean a huge new opportunity for PV. 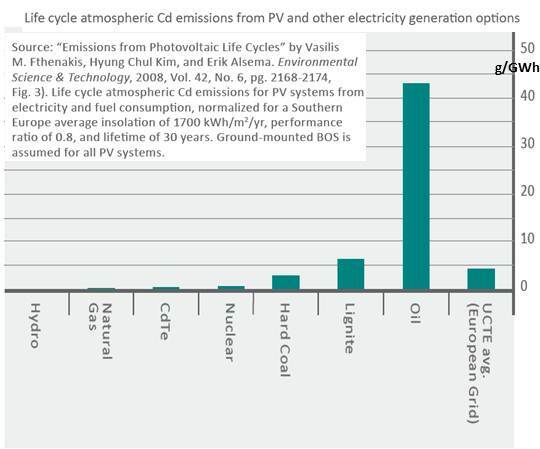 A new report offers the latest evidence of solar energy-generated electricity’s approach to cost parity with other forms of generation that send power to the grid. Two things make "Levelized Cost of Solar Photovoltaics in North Carolina," from the North Carolina Sustainable Energy Association (NC SEA), an especially valuable contribution to the tracking of solar energy’s approach to grid parity. 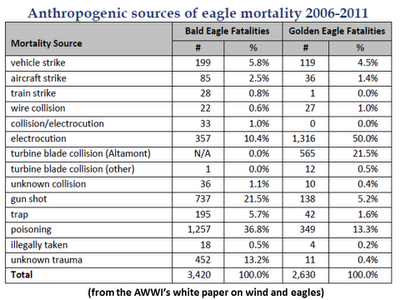 First, it is based on a substantial data set. Second, its methodology is comprehensive and transparent. Though the report’s conclusions are particular to North Carolina, NC SEA Managing Director and report co-author Paul Quinlan said, installed costs for solar PV systems are falling across the country. 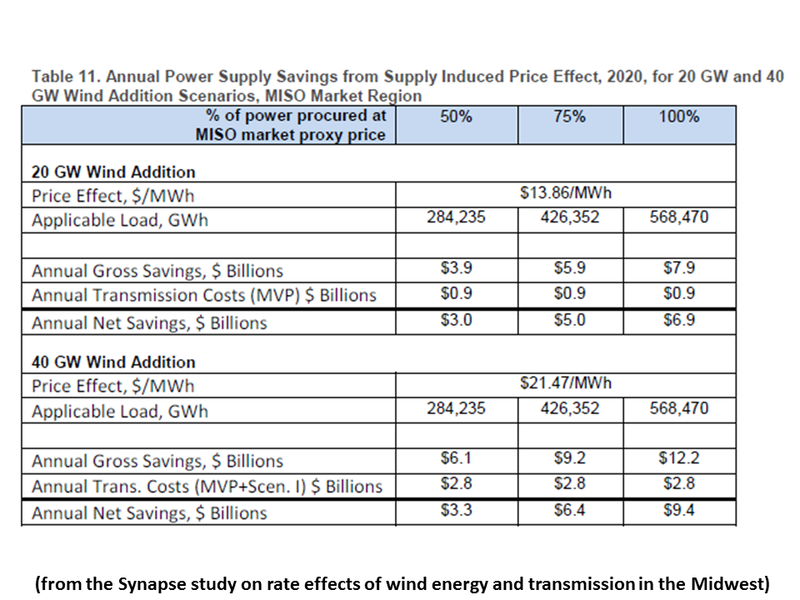 “But grid parity,” he stipulated, “depends on retail utility rates and those can be very different” from state to state. 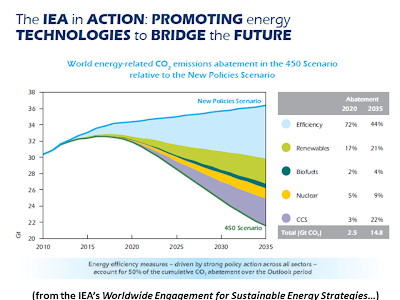 One thing that should be noted upfront: Grid parity in this report has nothing to do with avoided costs (emissions, transmission building, etc.). 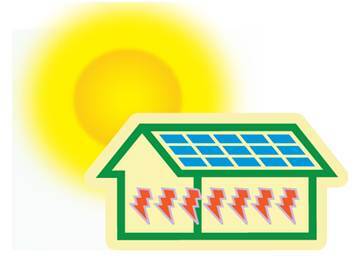 The calculations are based on the levelized cost of photovoltaic (PV) system electricity (LCOE) and the retail cost of commercial and residential electricity from North Carolina’s three investor-owned utilities (IOUs), 71 municipally owned utilities (MOUs) and 31 electric cooperatives (Co-ops). The data comes from over 10,000 solar PV system installations in North Carolina from 2006 to 2011 whose owners, per a state regulation, reported installation costs to the Public Utilities Commission. 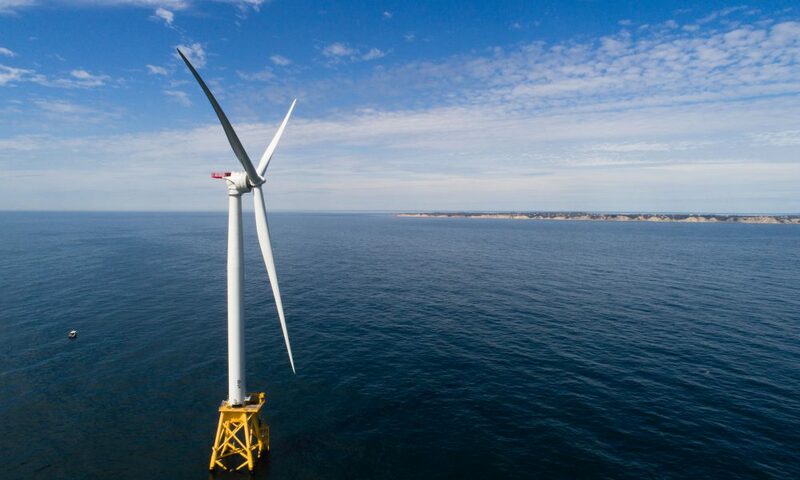 North Carolina’s installed renewable capacity has expanded significantly since it became the first state in the U.S. Southeast to institute a renewable energy portfolio standard (REPS). Its standard requires IOUs to get 12.5 percent of their power from renewables by 2021 and MOUs and co-ops to get 10 percent by 2012. Solar has grown due to a carve-out in the REPS specifying that it account for 0.2 percent of the mandated goals. The report’s researchers looked at three system sizes, residential (10 kilowatts or less), commercial (10 to 500 kilowatts) and utility scale (greater than 500 kilowatts), Quinlan explained. 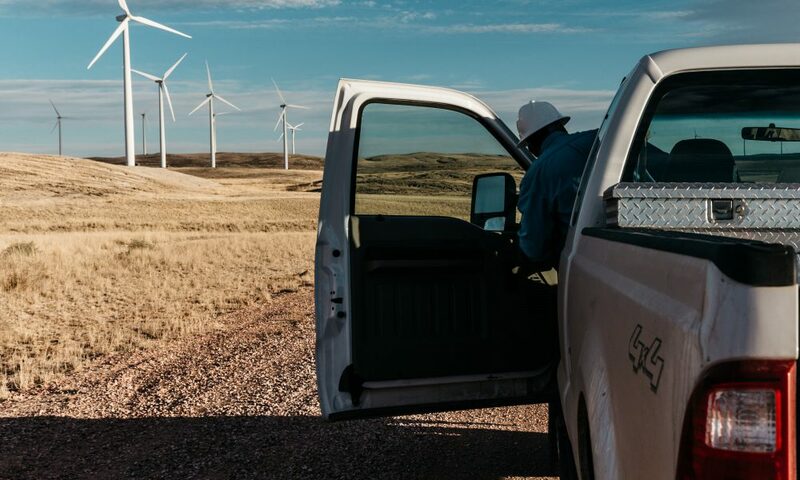 The team established an average installation cost for each year in the study and projected the downward trending curves out to 2020 (setting a one-dollar-per-watt baseline). System life was assumed to be twenty years, Quinlan said, though warranties on the systems are usually for 25 years and most contemporary panels last 30 years or more. Costs were calculated both with and without the federal 30 percent investment tax credit (ITC) and the state 35 percent tax credit. Financing was assumed to be 50 percent equity and 50 percent debt at six percent interest, Quinlan said. These parameters reflect the researchers’ efforts to characterize the LCOE conservatively and transparently so that, Quinlan said, “we can take them into any conversation” without being accused of advocacy. 1. For many of the utilities, the LCOE of solar PV systems over 10 kilowatts (with federal and state tax credits) were at grid parity or cost-competitive with commercial retail electricity prices in North Carolina in 2011. 2. 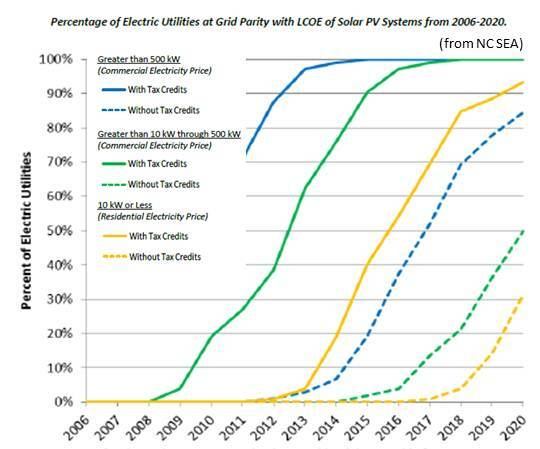 For all North Carolina electric utilities, solar PV systems greater than 500 kilowatts will achieve grid parity or become cost-competitive with commercial retail electricity prices in 2015 (with federal and state tax credits). 3. For all North Carolina electric utilities, solar PV systems from 10 kilowatts to 500 kilowatts will achieve grid parity or become cost-competitive with commercial retail electricity prices in 2018 (with federal and state tax credits). 4. 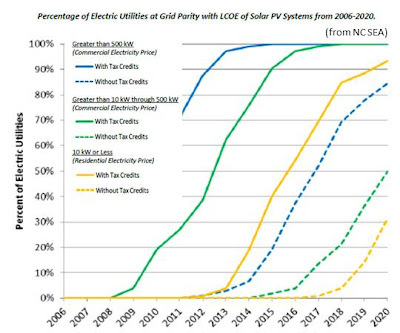 For the majority of North Carolina electric utilities, solar PV systems smaller than 10 kilowatts (rooftop solar) will achieve grid parity or become cost-competitive with residential retail electricity prices in 2020 (with federal and state tax credits). 5. 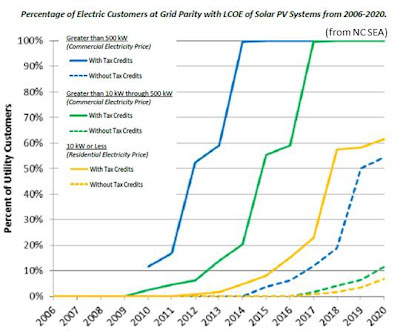 For many electric utilities, solar PV without federal and state tax credits will be at grid parity or cost-competitive with retail electricity prices in North Carolina in 2020. Quinlan said the first conclusion is the most important. “In 2011, there will be a good number of places where utility-scale solar and even some small commercial solar is at grid parity with some of the commercial retail rates,” he said. Many in North Carolina and other Southeastern states where the solar resource is comparable, Quinlan said, are unaware that the LCOE (even with Renewable Energy Credits and tax credits) has come down so far so soon. This, Quinlan said, demonstrates that solar PV in the North Carolina is becoming quite competitive with grid-supplied electricity, in some places and cases even without incentives.